Since the avocado toast craze began, fancy toast has become the new normal, a dish to eagerly anticipate. 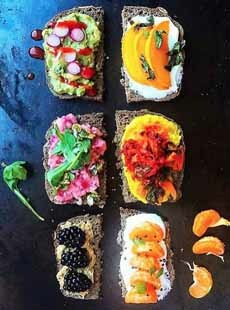 Toast toppings are now as diverse as the people making them: savory, spicy, sweet, and perhaps a mix of all three. 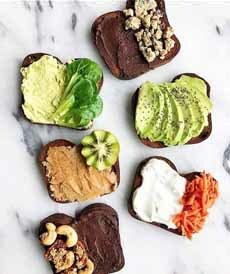 Our colleague Hannah Kaminsky of Bittersweet Blog, looked at the nut butters in her cupboard and made the following toasts with nothing more than other basic ingredients found in the same cupboard. Some are obvious, some are a bit more avant-garde, but all are thoroughly delicious. Hannah’s toasts are vegan, but you can substitute nut butter for cream cheese, dairy butter, hummus, ricotta or other spreadable, and add or exchange breakfast or other meats or seafood. And don’t forget the base element: bread. Baguette, brioche, challah, ciabatta, English muffin, fruit bread, olive bread, nut bread, peasant bread, pita, pumpernickel, rye, soda bread, sourdough, whole grain, even white bread: The world is yours to toast. Get inspiration from the following, then design your own for breakfast or snacking. From top: chocolate spread with streusel, avocado with chia, cream cheese with carrot saw, chocolate with mixed salted nuts, spicy peanut butter and honey with kiwi, edamame hummus with baby spinach (both photos courtesy Hope Foods). From top left: mashed avocado with radish and sweet chili drizzle, cream cheese with roasted squash and stir-fried sage, yellow bell pepper spread with kmarinated red peppers and grilled mushrooms, cream cheese with mandarin segments and chia, hummus with blackberries, chopped egg whites and beets with watercress. WHAT ARE YOUR FAVORITE WAYS TO TOAST?